The following is a transcription of the list of contemporary or near contemporary portraits given in the Appendix to J.M. 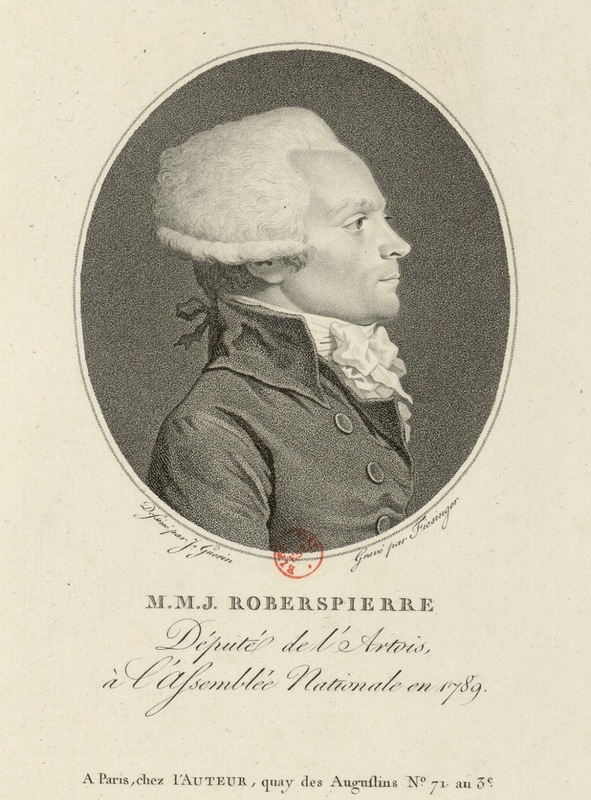 Thompson's 1934 biography of Robespierre. Thompson relies mainly on Buffenoir's classic work Portraits de Robespierre (1908/9) with a few additions and comments. The list is broadly chronological. It is frustrating to note just how few of these pictures have a reliable provenance. Not many are in public collections - a good few, indeed, seem to be known only from Buffenoir's plates. 1. Oil painting by J. Boze, exhibited at the Exposition, Paris et la Révolution in 1931; reproduced in R.S.W. 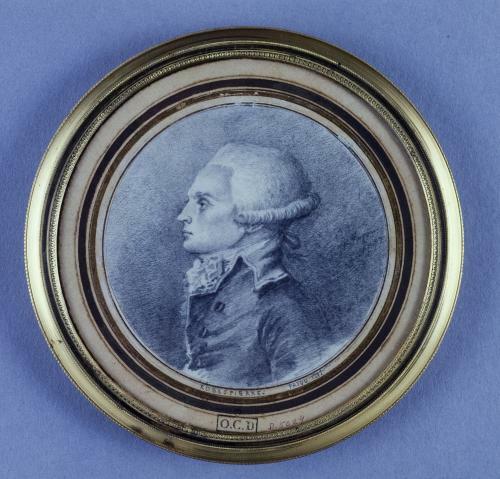 Ward, Robespierre: a study in deterioration (1934) as representing Robespierre at the age 17. In Getty Images with date of 1800. 2. Oil painting by Boilly, done at Arras in 1783, when Robespierre was 24. It belonged to the family, and was purchased for the Carnavalet Museum (where it is now) at the Dancoise sale in Paris about 1900. Buffenoir (frontispiece). 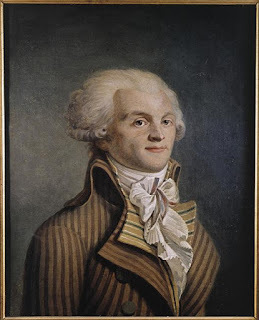 AR vol.1(2), p.247-50: Robespierre "before the storm of '89": Buffenoir comments on "the honesty which the face breaths and the strength it reveals"
This painting is now generally considered to represent Augustin Robespierre. 3. 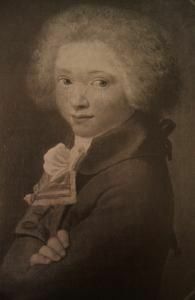 Picture in the Saint-Albin collection, described by Michelet (2/257) and Lewis (53) with the inscription Tous pour mon amie; said to be the earliest portrait of Robespierre. Should belong to much the same date as No. 2. 4. Oil painting by Danloux, done in Arras in 1789 (aet 27) and showing Robespierre (?) in the dress of a deputy to the States-General; in a private collection. (3/4 length, full face, frizzed hair, right hand holding hat under left arm, left hand on sword-hilt, black frock-coat and waistcoat.) 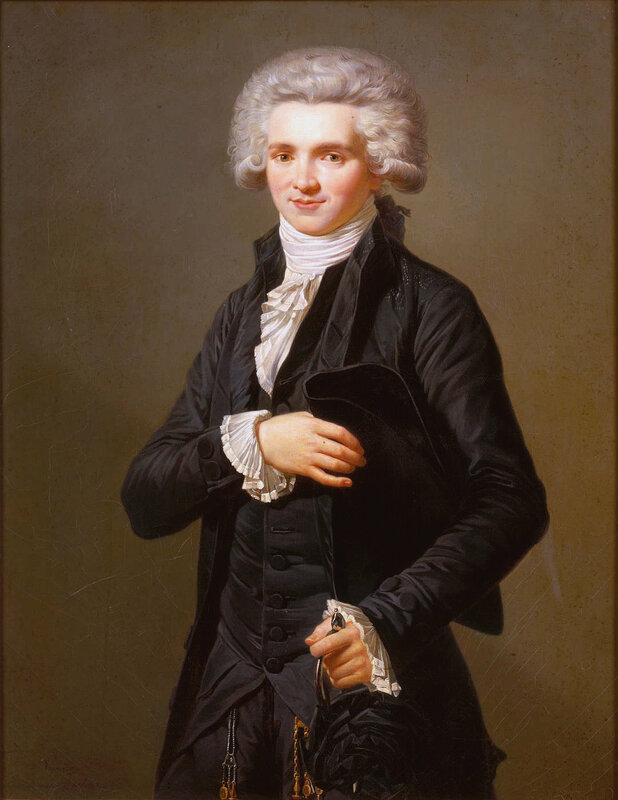 It looks too young (Robespierre was 31 in 1789) and bears no resemblance to later portraits. Buffenoir, AR, vol. 1(2) p.256-9. Present location unknown(?). There is a possible copy by Pierre-Roch Vigneron in the Versailles collections (oil on canvas, 75 cm x 58 cm.) Despite Thompson's misgivings, the picture is generally accepted to represent Robespierre. 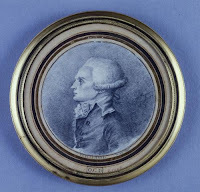 Carr, Robespierre: the force of circumstance (1972) reproduces a photograph of the Vigneron portrait, or its original, from the Mansell Collection which he annotates as "The so-called 'Irish' portrait by Vaquelin, engraved by Guyard". Not sure Vaquelin was, or what to conclude, other than that the history of this image is very muddled! The iconic image of Robespierre. Oil on canvas, 60 × 49 cm. Acquired by the Carnavalet in 1883. Provenance unknown. Buffenoir, AR vol.1(4) 647-8. Plate 33. "This portrait is considered by connoisseurs as one of the best executed." Portrait by Guérin, engraved by Gabriel Fiesinger. 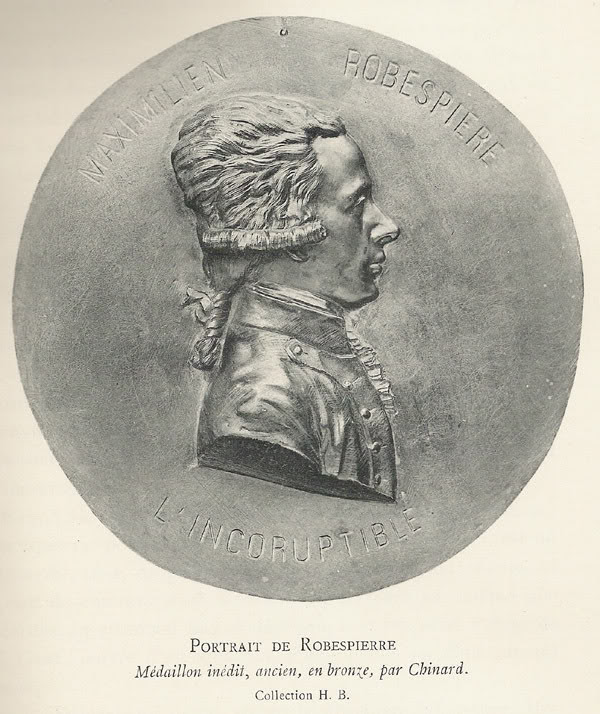 Inscribed "M. M. J. Robespierre, Deputy for Artois in the National Assembly in 1789". There are many examples and variants of this engraving. 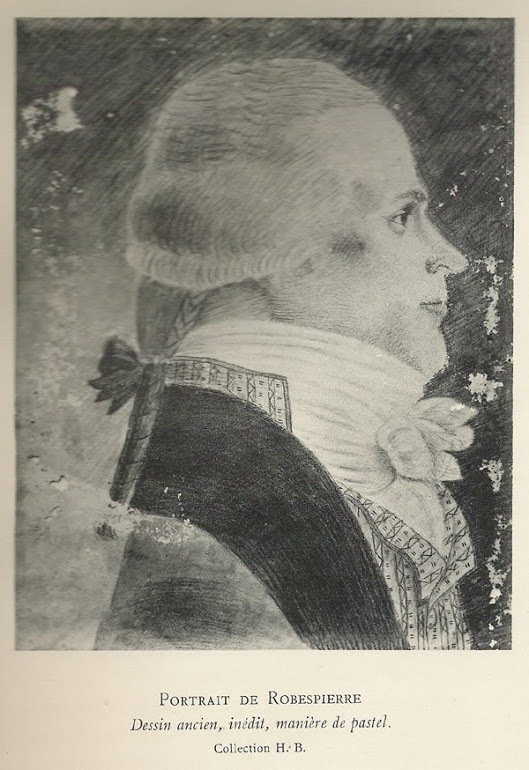 PRINT OF ROBESPIERRE. I should much like to learn something of a print now before me: portrait, half-face, paper octavo page size, metal, print, oval 3 x 3 in. exactly to line, set off from stipple, printed off in reddish-brown ink ; the paper seems cut down, and the print may have formed part of a volume, as there is a narrow strip, whiter than the plate- paper, pasted along backedge, evidently cut with a knife. 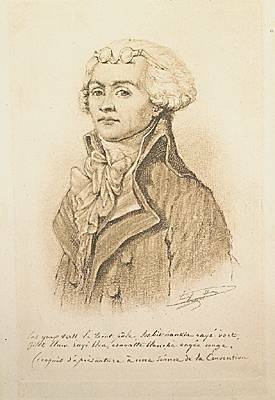 The print is titled M. M. J. Robespierre Dessiné par J. Guérin, Gravé par Fiesinger. The portrait was likely drawn in sanguine, and the ink of the printing kept near the colour. Born, Arras, 1759; depute, Paris, 1789; guillotined there July 28, 1794; he was only thirty-five.-. And all the horror of his name is contained in five terrible years. He got a public triumph in 1791. Is this a likely date for the portrait? He would then be thirty-two, which would agree with the portrait as to age pretty well. PRINT OF ROBESPIERRE (4 th S. v. 341.) - I can only answer partially to this query. The print is one of a series - all good and expressive - by Fiesinger after J. Guerin. The others I likewise possess are Petion, Rewbell, Barnave, Charles and Alexandre Lameth, Malouett, Rabaut, St. Etienne, Bertand, Barere de Vieuzac, La Rochefoucauld, Liancourt and Mirabeau. They can be had at Danlo aine, Quai Voltaire Paris. Under the name of Robespierre stands, "Depute de l'Artois a l'Assemblee Nationale en 1789" which gives the probable date of this print. He was then thirty years of age. 7. Silhouette of 1790-91(?) attributed by Rabbe to Fragonard. Thompson refers to an exchange in La Révolution française : revue historique (1900) vol. 38, p.256; 470; vol. 39, p. 278,382 ,462.
the upshot of the discussion is that it does not represent Robespierre". The portrait in question is one of a pair of medallions painted on the stairs of the villa Maubert in Grasse. Fragonard's sejourn at the villa is now usually dated to 1790-91, a date also suggested for the picture by the fact that the companion portrait is that of the abbé Grégoire. There seems no particular reason to doubt that this is intended to be Robespierre. According to Buffenoir, an inscription on an old calling card was stuck to the back: "Isidore-Maximilien Robespierre, Arras, 1759 à 1794. Directeur du Comité de Salut public (Couton (sic) et Saint- Just), attaqué et vaincu par un parti, le 10 Thermidor (28 Jl). Son frère guillotiné le lendemain."
? Hum. I'm sure I've seen a photo of a portrait with a card on the back.... but I can't find it now. 9. Pastel by Mme Guyard, shown in the Salon of 1791; since lost. Adélaïde Labille-Guiard exhibited in the Salon of 1791 thirteen portraits of public men, of which No.34 was Robespierre. I can't find a this engraving, if it ever existed. The oil by Pierre-Roch Vigneron (No.4) is sometimes also said to be a copy of the Labille-Guiard portrait, but Buffenoir is probably correct to doubt this identification. Identified in the Dictionary of Pastellists with a pastel by Boze in the Musée Lambinet (left) More speculatively, with No.41. Buffenoir, AR vol.1 p. 253. Plate 2 (Plate 1 of the AR version). From Buffenoir's own collection, otherwise unknown (?) A bit of a fat Robespierre! See: Buffenoir, AR vol. 1(2) p.253: a "superb pastel" which shows Robespierre's "firm intelligence, courage and moral force". 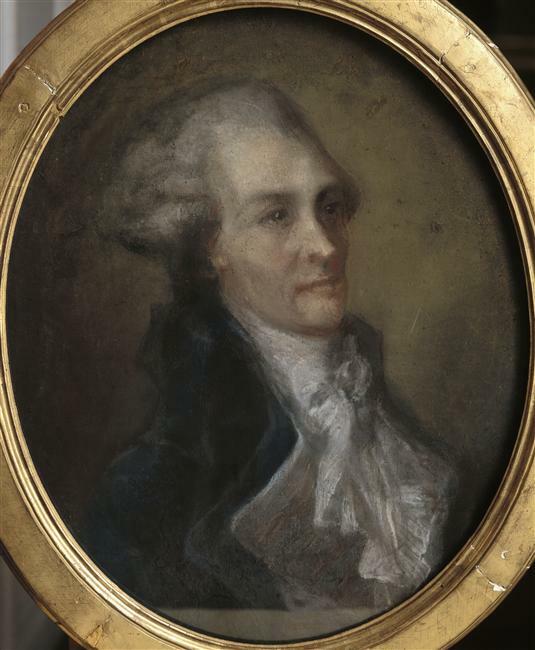 Described as right profile, showing white powdered wig, lace jabot, large cravat, light coloured coat.
? Is there a plate of this one - I can't find it! 13. Medallion of 1791 by Chinard of Lyon..
Buffenoir, AR vol. 1(3), p.458-9; Plate 24. Medallion in Buffenoir's collection. 23cm in diameter. Signed by Joseph Chinard and dated 1791. By Augustin Pajou, signed and dated "1797"
15. Tinted drawing, from M. George Duruy's collection. Buffenoir, AR vol.1(2), p.254. Plate 3. I am not sure if the original still exists. The stripped coat and elaborate cravat suggests a relationship to the famous Carnavalet portrait (No.5)? Buffenoir, AR vol. 1(2) p.253-4.Buffenoir notes the existence of two engravings after Gérard, but these cannot be identified with the lost portrait as they are only busts. 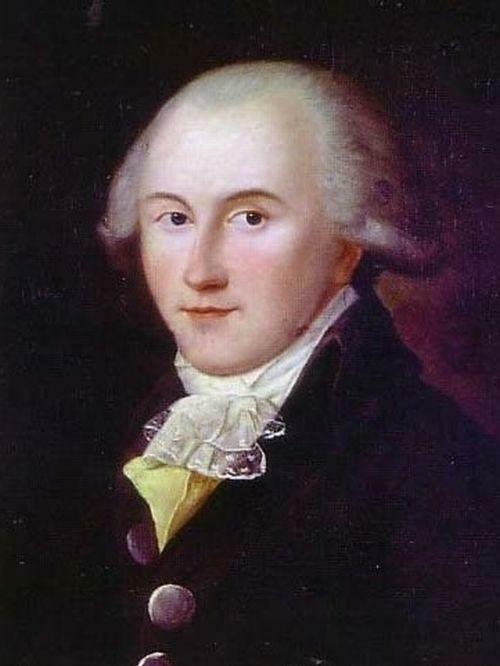 The portrait, together with many of Robespierre's manuscripts, was burnt by Simon Duplay in 1815. The references to Buffenoir by Thompson are a little confusing as there are two different versions of Buffenoir's text, a set of articles in Annales Révolutionnaires (1908-9) and a slightly later monograph. Thompson refers mostly to the articles, but the numbers given for the plates must be to pages in the later version(?). At nr.16 its said that Simon Duplay burt the portrait and many of Robespierre's manuscripts in 1815. Why did he do that? The papers concerned had been illegally hidden from the Convention by Eléonore Duplay. At the time of the 1815 Restoration, Simon Duplay was working as a minor functionary and living in Paris with his sister. It is just recorded that he had "a moment of fright" and burnt the compromising documents. It wouldn't have been a great moment to be caught with a portrait of Robespierre either.